It’s time for great-grandma to pull her weight around here. 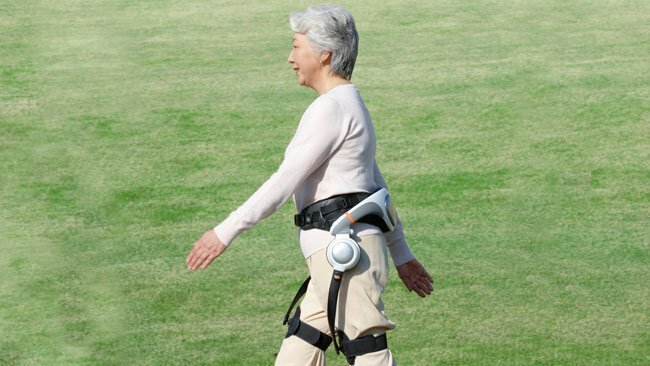 Exoskeletons for the elderly, lightweight scaffolding that fits over the user’s arms, legs, and torso to improve strength and speed, have already debuted in Japan, where the number of young workers has plummeted and businesses need people to continue to perform manual labor. Researchers at Aalborg University in Denmark as well as Japanese robotics company Cyberdyne are both working on models, the AXO Suit and HAL, respectively. The AXO suit should be ready for market in a few years, but HAL is already being supplied to workers in Tokyo’s Haneda Airport who need help lifting heavy luggage. There’s nothing controversial about relieving back pain for those who do manual labor (the stated goal of HAL, for example), but as exoskeletons to aid the elderly move into more airports, construction sites, and the manufacturing industry, we might wonder if extending the labor years is really in peoples’ best interests. Some workers might want an excuse to work forever, but many want to retire and look forward to years without labor. As birthrates decline all over the world, scientists and engineers have been looking for ways to keep the elderly population active and healthy, the alternative being a shortage of funds for their pensions and healthcare. But is automating the elderly really in their best interests if it strips away at the golden years?